Photo by Dave Stelfox from The Village Against the World. When the 1,200-hectare El Humoso farm was finally won in 1991 – awarded to the village by the regional government following a decade of relentless occupations, strikes and appeals – cultivation began. The new Marinaleda co-operative selected crops that would need the greatest amount of human labour, to create as much work as possible. In addition to the ubiquitous olives and the oil-processing factory, they planted peppers of various kinds, artichokes, fava beans, green beans, broccoli: crops that could be processed, canned, and jarred, to justify the creation of a processing factory that provided a secondary industry back in the village, and thus more employment. “Our aim was not to create profit, but jobs,” Sánchez Gordillo explained to me. This philosophy runs directly counter to the late-capitalist emphasis on “efficiency” – a word that has been elevated to almost holy status in the neoliberal lexicon, but in reality has become a shameful euphemism for the sacrifice of human dignity at the altar of share prices. … The town co-operative does not distribute profits: any surplus is reinvested to create more jobs. Everyone in the co-op earns the same salary, €47 (£40) a day for six and a half hours of work: it may not sound like a lot, but it’s more than double the Spanish minimum wage. Participation in decisions about what crops to farm, and when, is encouraged, and often forms the focus of the village’s general assemblies – in this respect, being a cooperativista means being an important part of the functioning of the pueblo as a whole. 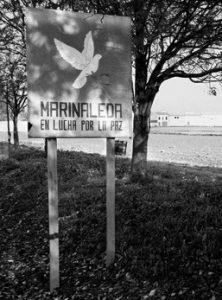 Where once the day labourers of Andalusia were politically and socially marginalised by their lack of an economic stake in their pueblo, they are now – at least in Marinaleda – called upon to lead the way. Non-co-operativists are by no means excluded from involvement in the town’s political, social and cultural life – it’s more that if you are a part of the co-operative, you can’t avoid being swept up in local activities outside the confines of the working day. It’s true, Marinaleda is really a huge economic and social success. They made something really great there. Still, comments and critiques have been made (by activists in Spain, some close to social ecology) that some progress should be made from the “democratic perspective”. There have been critiques about the important part played by the mayor (still the same for 35 years). Do you know if they speak about that point in their book ? Still, I won’t critique them too much, especially in regard to what happens everywhere else, and particularly now in Spain ! It’s still a example that should be look at and followed.